Miguel Roberts/The Brownsville Herald The interior is shown at the newly constructed Music, Science & Learning Center at The University of Texas Rio Grande Valley's Brownsville campus. A new academic year typically brings plenty of change. For music professors and students attending classes at the University of Texas Rio Grande Valley’s Brownsville campus, this year is opening the doors on a long-awaited one. School of Music faculty and staff are settling into their new wing in the Music, Science & Learning Center. Director Kurt Martinez said professors began moving into the building in July, and finishing touches are being made to ready the building for the first day of classes Monday. The UT System Board of Regents in 2013 approved $54 million in Permanent University Fund bond proceeds for the 102,500-gross-square-foot building. It’s just east of the Main Building and is made up of two freestanding wings joined by a courtyard and a sky bridge. The School of Music will occupy three floors in one wing, while the other houses science laboratories, classrooms, meeting rooms, study space and offices. Miguel Roberts/The Brownsville Herald The interior of the the piano instruction room is shown at the newly constructed Music, Science & Learning Center at The University of Texas Rio Grande Valley's Brownsville campus. 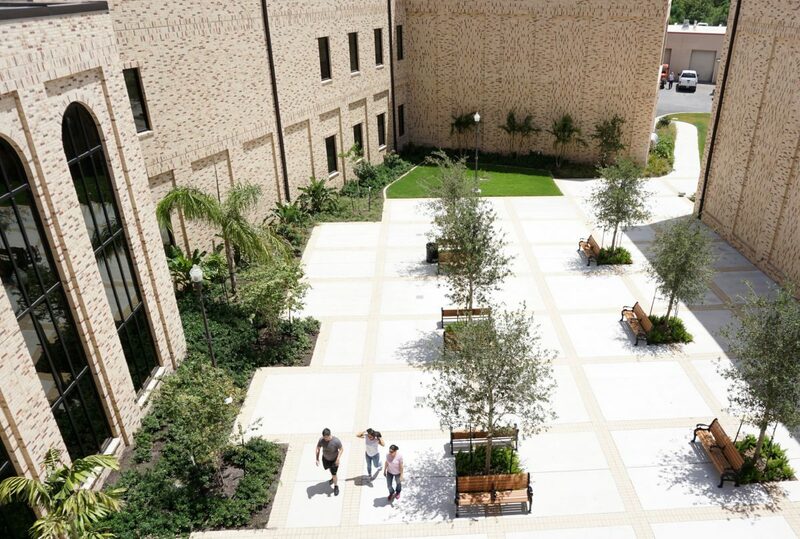 Miguel Roberts/The Brownsville Herald The courtyard is shown at the newly constructed Music, Science & Learning Center at The University of Texas Rio Grande Valley's Brownsville campus. Martinez said the School of Music in Brownsville previously was housed in Texas Southmost College’s Eidman Hall. It had been a science department building and wasn’t well-suited for music classes when it came to both space and acoustics. The Music, Science & Learning Center has been designed with state-of-the-art soundproofing, Martinez said. 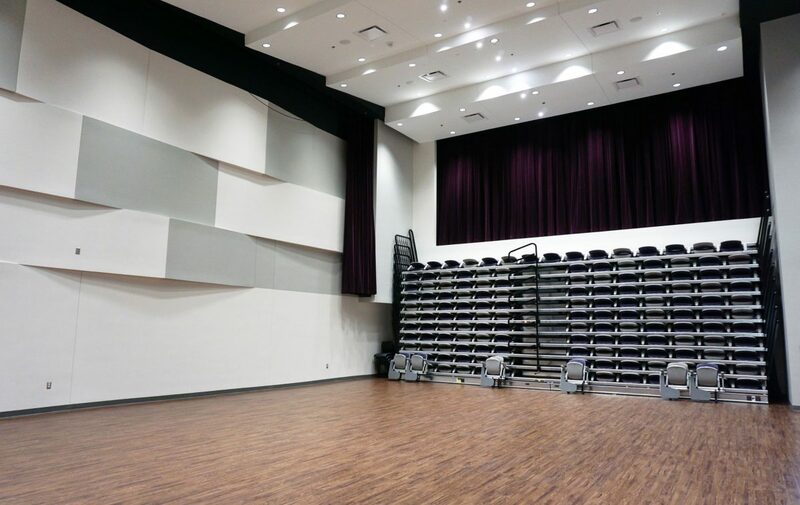 The 165-occupancy recital hall has retractable seating that can turn the room into a lecture hall with the push of a button, as well as curtains that can dampen or enhance reverb depending on what’s needed. 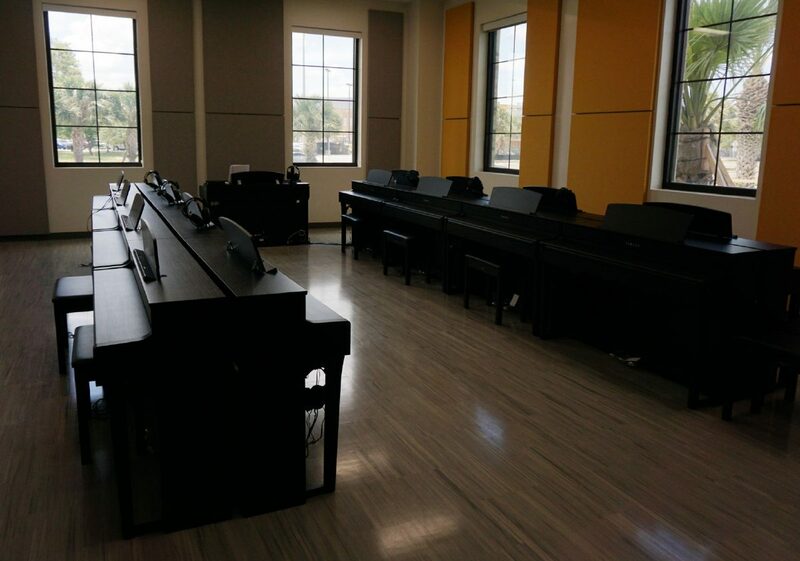 The music wing also boasts practice rooms, classrooms, a lactation room, lockers, technology lab, piano studio offices and a newly furnished piano lab. Martinez demonstrated the piano lab’s headset system, which allows students wearing a headset and microphone to practice without hearing each other but also allows the professor to listen to and speak with each student individually. “The piano lab was really old. When (professors) got this, they were extremely excited,” he said. Susan Hurley-Glowa is a professor of ethnomusicology, moving into her studio office after a year-long sabbatical. She was pleased with the new building and said the move has gone smoothly, adding that Eidman Hall was known for its unpleasant odors and temperatures that fluctuated wildly. Hurley-Glowa said the facility also brings the music department closer to the rest of the university’s buildings. Administrative assistant Adriana Vela had similar feelings about moving closer to other departments. The Brownsville campus Interdisciplinary Academic Building is still under construction and scheduled to be completed in January. The 55,500-gross-square-foot building will house physics labs and classrooms. Brownsville projects completed this year include the 295-space East Parking Lot and three-building, 12,560-square-foot administrative offices named Vaquero Plaza. Martinez said the new music wing also was needed because demand for the music program is growing. The school received 244 applications for the fall, he said, up from 144 in 2015. Approximately 120 students will be admitted, he said. The new facility will allow the department to expand its degree offerings in the future, Martinez said, into areas such as music entrepreneurship and music composition.